No one would argue that our military veterans deserve our thanks and our praise. To honor them in ceremony and parade, to set aside time out of our daily lives to show them how much they mean to us, and to display their accomplishments with pride are things we would all gladly do. No one would argue that our military veterans deserve our thanks and our praise. To honor them in ceremony and parade, to set aside time out of our daily lives to show them how much they mean to us, and to display their accomplishments with pride are things we would all gladly do. But we might ask ourselves how we might do those things in the best way possible. How do we show the world just how proud we are of our loved ones for serving with such distinction in of military armed forces, whatever the branch? If you have a loved one for whom you wish to show this kind of respect and pride, consider the Military Flag and Medal Display Case. Our Military Flag and Display Case is made of finely crafted wood with an elegant cherry finish. Completely handmade by U.S. veterans, each case is made with the love and honor you, yourself, have for your loved one. The cases are made with your specifications in mind and are designed to hold and display commendation medals and badges, along with a 5x8 United States flag. In addition to the real wood and lovely cherry finish, the Military Flag and Medal Display Case includes a black, felt lined backboard on which medals, badges, certificates and pictures can be mounted. Every veteran�s story is different. Every veteran�s loved one has his or her own way of wishing to honor that story. If you have a loved one who has served, then you have your own wish as to how you might best honor that veteran you know and love. This wonderful display case allows you the freedom of a shadow box style display case. Arrange medals, badges, or whatever you wish in whichever way you wish. The flag portion of The Military Flag and Medal Display Case is designed in this particular instance for the 3x5 flag or the 4x6 flag, or the 5x8 flag or even the 5x9.5 military U.S. flag. This flag is the size used in military ceremonies and is the size flown on military bases. When this flag is given, there has been a special honor bestowed upon the veteran. Now that it is being retired from service as well, doesn�t it make sense to display this symbol of our country proudly? Now you can display this flag right alongside the other commendations and medals your loved one has been given. If you�ve been searching for way to honor your U.S. veteran in a way that will be a lasting tribute to his or her service, look no further. 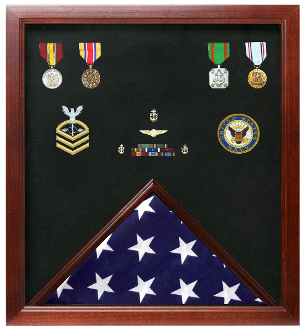 The Military Flag and Display Case is exactly what you�ve been looking for.